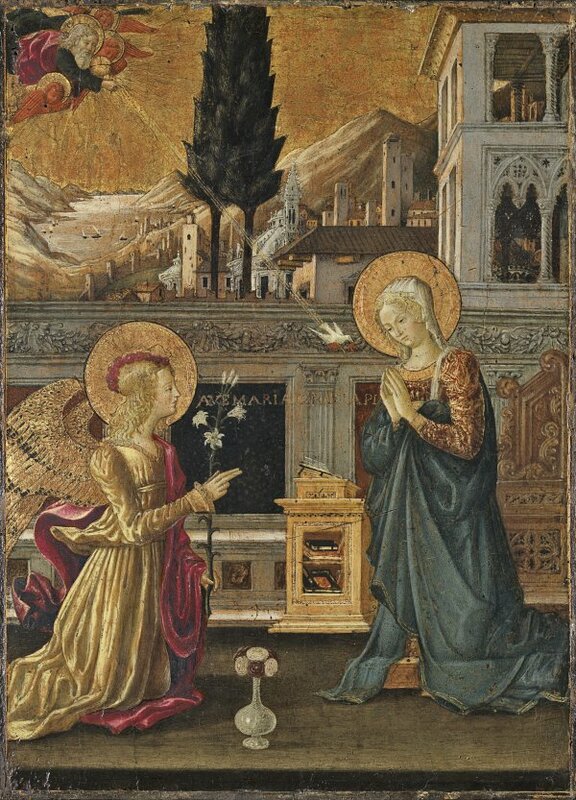 This Annunciation was acquired by Baron Hans Heinrich Thyssen-Bornemisza in 1977, the year in which the panel appeared on the Italian art market. Prior to that it had belonged to a private collection in Rome, and during the 19th century it was in the collection of Thomas Pelham Hood in Springmount, Ulster. Benedetto Bonfigli was born in Umbria. His earliest works reveal the study that he made of artists such as Fra Angelico, whose influence would be relatively important for his output; Domenico Veneziano, documented in Perugia between 1438 and 1454, who inspired Bonfigli’s landscape backgrounds; and Gentile da Fabriano. 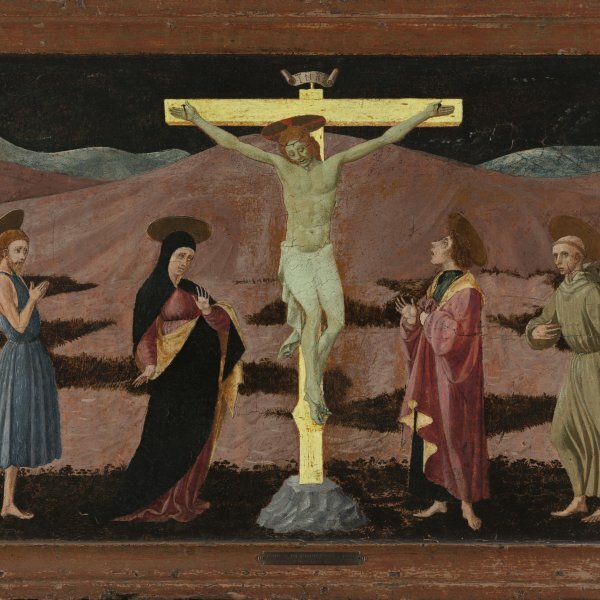 The first reference to Bonfigli’s professional activities dates from 1445 and relates to the execution of a Virgin for a chapel in the church of San Pietro in Perugia. One of his finest works was the fresco decoration of a chapel in the Palazzo dei Priori in Perugia, begun in 1454. Benedetto Bonfigli also designed banners for confraternities of which various examples survive. The Annunciation was first published by Federico Zeri in a detailed article in which he attributed the panel to Bonfigli. While this attribution was generally accepted, the dating of the work is less clear, and it has been dated to the 1440s and 1450s. Bonfigli located the two figures outdoors on a terrace with a view behind of an idyllic city on the shores of a lake. The painter used gold in large areas of the composition, not only to highlight details that emphasise the divine elements such as the haloes and the beautiful wings of the angel, but also for more earthly elements such as the designs on the textiles and the sky. In the latter, God the Father sends the Dove of the Holy Spirit with its two small flames directly to Mary’s heart. Nonetheless, the use of gold, which is associated with the earlier Gothic style to be found in the local tradition with which Bonfigli was familiar, does not detract from the sense of depth and perspective in the scene, nor does it make the various elements within it less realistic. Rather, it contributes to creating a setting appropriate for this miracle. The artist used a setting in which the gold elements are combined with other Gothic features such as the windows of the loggia on the right and the tops of some of the buildings in the city. He skilfully combines such details with other purely classical ones such as the low wall dividing the foreground from the city, whose design and materials look to more modern solutions. This panel, which Zeri considered an exquisite and delightful work, was inspired with regard to its landscape by Domenico Veneziano. It has been compared with that artist’s Adoration of the Magi in the Gemäldegalerie in Berlin, from which Bonfigli derived the motifs of the pine trees in the middle distance which act to increase the sense of depth. The influence of Fra Angelico is also evident in details such as the delicate glass vase filled with roses in the immediate foreground.